Could Hoda and Meredith be the messiest duo on daytime television? Probably! That’s why this next segment was perfect for them. Professional organizer Amanda LeBlanc shared her easy – and surprisingly affordable – tips for de-cluttering your home, car, closet and more. Plus, learn Amanda’s favorite products and where to get them. Amanda LeBlanc shared organization tips for the closet, bathroom, kids’ room and more. Closets are so difficult to keep neat and organized, and it’s all because of lack of space. Even if you have a small closet, there are ways that you can expand your storage space and de-clutter your clothes, shoes, accessories and more. 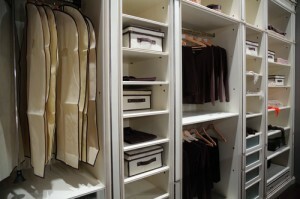 Amanda suggests trying an adjustable Organized Living Closet. These closets range in price from $150- $1,320, and can immediately double or triple your storage space. You can also try color-coordinating clothes to make them easy to find. The bathroom is another small space that can often feel cluttered, especially in the morning when you’re rushing to get ready for work. Amanda actually brought her own bathroom drawer to display how easy bathroom organization can be with acrylic drawer trays. They are very inexpensive ($2.75 – $6.99), easy to clean and make getting ready in the morning so much faster. Jewelry Boards are not only a great way to keep jewelry neat and tangle-free, but also a great way to display your favorite pieces. They range in both size and prize, from $24.99 to $59.99. For a child’s room, keep toys, books and everything else neatly tucked away in Pottery Barn‘s Sabrina Baskets ($18- $79.50). They have labels with both words and pictures, so even if your child can’t read, he can still be organized! In the car, try the Kid Car Organizer, $39.99. If too much mail clutters your office space, then get your hands on these super affordable hanging file folders. Quickly and easily file your mail for just $1.50.